Its seems there has been a return to both frugality and simplicity in Italy, with dishes usually associated with hard times appearing on top restaurant menus. ‘La Cucina Povera’ (the Pauper’s Kitchen) is trendy! In the South of Italy where hardship has more or less always prevailed, dishes using stale bread or legumes such as Panzanella and Pasta e Fagioli (pasta with beans) have always been a necessity and remained highly revered. 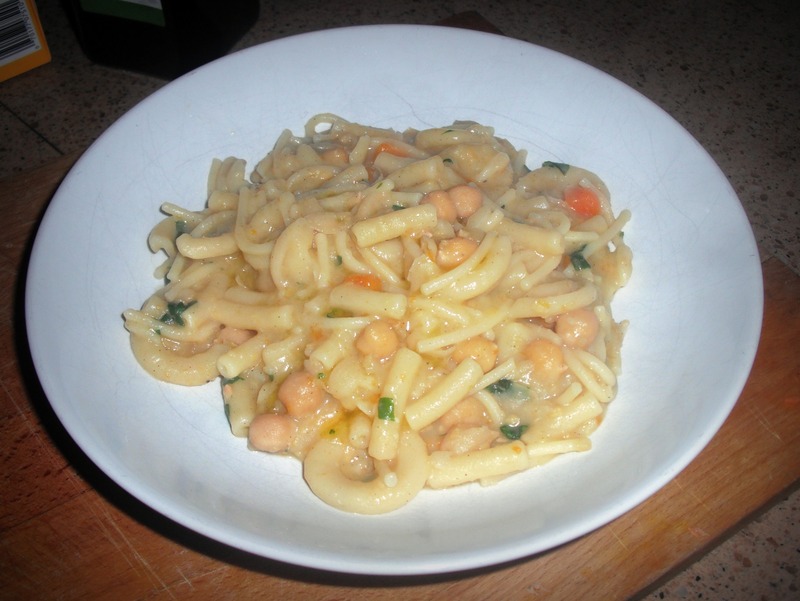 Below is my recipe for Pasta e Ceci, (pasta with chickpeas), a cousin of sorts to Pasta e Fagioli. Using leftover handfuls of different types of pasta and chickpeas which are always readily available and highly economical, this dish is filling, tasty and inexpensive to make. You can make it to a thick soup consistency, or as the above – it depends how much water you use. As long as there is plenty of olive oil and garlic it will be tasty either way! Lightly sauté the carrots and celery in a little oil until soft and translucent. Add chopped garlic and chickpeas then cover, cooking for another ten minutes and stirring from time to time. Add water and simmer until chickpeas start to soften, then add the potatoes. When the potatoes are cooked, liquidize the contents of the pan to a coarse consistency, I like to leave some chickpeas whole. Add the pasta and cook until al dente and most of the liquid gone. Season generously with salt and pepper then add a handful of chopped parsley. Serve with generous drizzle of olive oil.